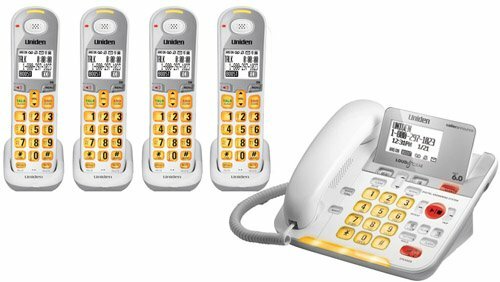 The D3098 Series Corded/Cordless Phone with Caller ID and Answering System has Caller ID Announce that allows you to hear the name or numbers of callers before answering. The corded handset will function during power outages and there's a keypad and speakerphone on the base. You will be able to hear loud and clear with amplified sound up to +30 db boost with adjustable audio tones. The silent mode quiets all ringers and incoming messages. Other features include a belt clip and headset jack, it can be expandable up to 12 handsets, and can be mounted on a wall with the included bracket. 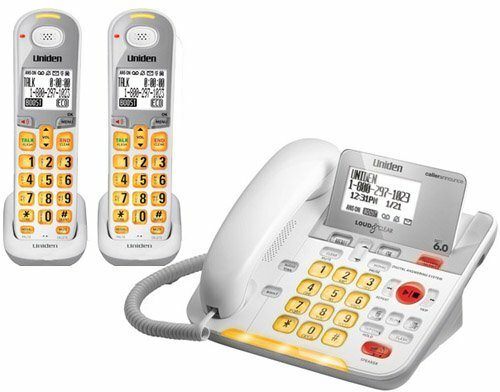 Uniden D3098-4 DECT 6.0 corded - cordless phone combo features DECT 6.0 technology to deliver enhanced voice clarity and security features. The 14 minute digital answering system features message alert, call screening, and time day stamp. The D3098-4 provides power failure protection, which retains vital information and allows you to make calls during a power outage. With sophisticated big button design, the phone also has large fonts, visual ringers, audio boost, caller ID announce on base and handset and adjustable playback speed. 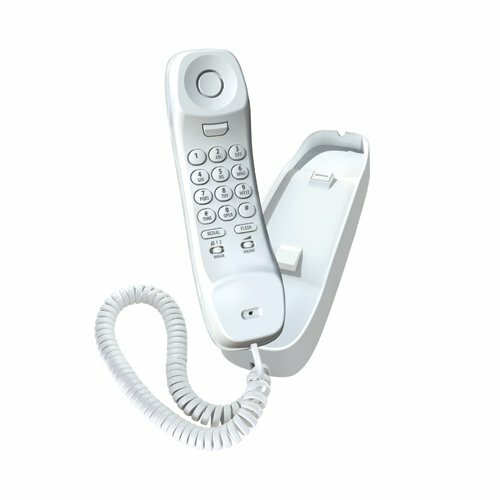 This wall mountable phone is hearing aid compatible. This unit comes with 1 extra handset and is expandable up to 12 handsets. The DECT4096 two-line cordless phone is packed with time-saving features coupled with DECT 6.0 technology - helping you run your life smoothly. The large LCD display on the phone and the base, and blue backlit keys make it a snap to dial the correct number or access features, even in the low-light conditions. The phonebook feature stores up to 100-names on both the handset and the base with an alphabetical search, unique ringers you can assign to specific calling parties, and an option to transfer either a single listing or the entire phonebook. The trilingual menus guide you through every step so you can take full advantage of the ten full hours of talk time per battery charge. Never miss a call with the digital answering system that has up to 30-minutes of recording time. 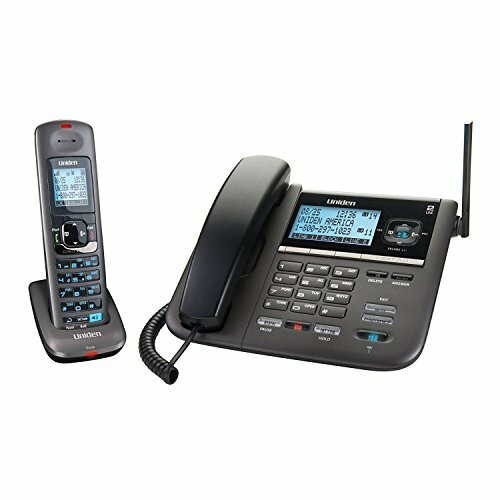 The DECT4096 features a corded telephone attached to the base and a cordless handset, and is expandable up to ten handsets with one base. 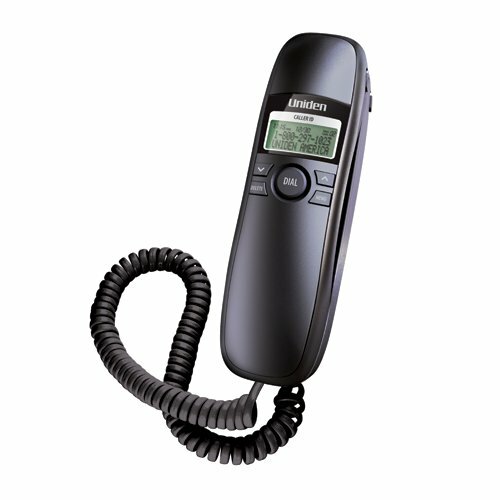 Enjoy the simplicity of the SLIM1260BK corded phone by Uniden. It features a caller ID screen on the top of the receiver so you can see the name and number of incoming callers before you answer. Reference the caller ID to locate previous phone calls using its 50 name/number caller ID log. The slim size features a timeless design and will sit unobtrusively on any table or desk. It has a three volume adjustment wheel so you can set the volume to your preferred setting. The SLIM1260BK is ideal for anyone who doesn't want the hassle of multiple features, or to use as a secondary phone in a part of your home that experiences less traffic. 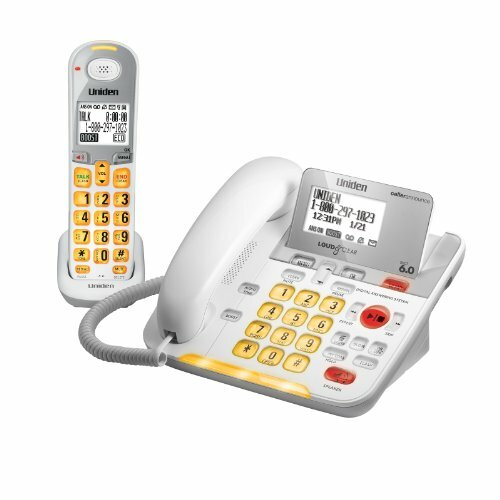 The D1788 Series Corded/Cordless Phone with Answering System has caller ID and call waiting. It includes superior clarity, security and range with digital DECT 6.0. The handset and base have speakerphones and you can use the silent mode to turn off all ringers. You can store up to 50 names and numbers in the caller ID and up to 100 names and numbers in the phonebook. There are message waiting indicators and even an intercom and call transfer. The ECO mode ensures longer battery life. This phone is expandable up to 12 handsets. 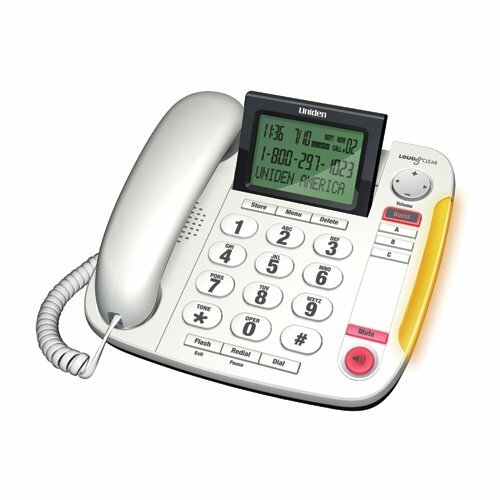 If you're looking for a basic, reliable phone, look no further than the CEZ260 desktop corded phone by Uniden. The simple design features a large base with big buttons so you can easily see individual keys and dial outgoing numbers. The large LCD screen displays all the information you need to take accurate messages including the name and number of incoming callers, the date and the time. Both the ringer and handset volumes can be adjusted so you can set it to your personal preferences. Use the 60-caller ID memory to review the history of previous calls, the 10-phonebook memory for storing your most popular numbers, and the three one-touch memory keys to quickly dial the numbers you use the most with a touch of a button. The CEZ260 is an affordable solution for those who want a quality phone without the hassle of multiple features. 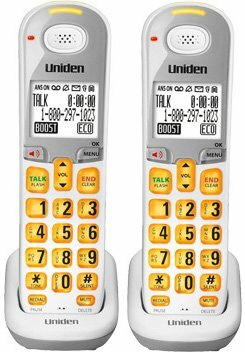 If you're looking for a basic, timeless phone - look no further than the SLIM1100 corded phone by Uniden. The slim, compact size of the phone will unobtrusively sit on any table or desk and can easily be mounted to the wall. It features hi/lo ringer settings and a three volume adjustment wheel so that you can set the volume to your preferred setting. This phone is ideal for anyone who doesn't want the hassle of multiple features, or to use as a secondary phone in a utility room or warehouse. 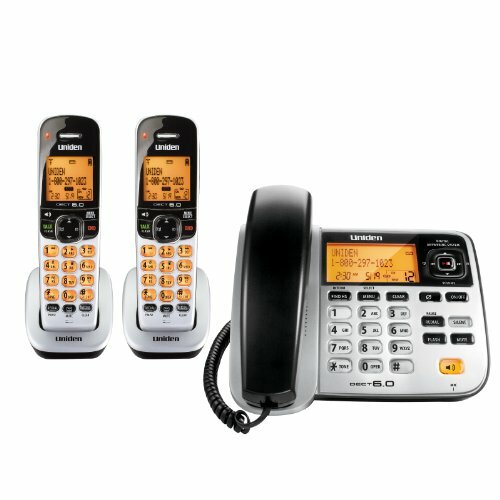 Compare prices on Uniden Corded Phone at Shopsimal.com – use promo codes and coupons for best offers and deals. We work hard to get you amazing deals and collect all avail hot offers online and represent it in one place for the customers. Now our visitors can leverage benefits of big brands and heavy discounts available for that day and for famous brands.